TAG (The Tinahely Arts & Craft Group) organised an “Art on the Street Exhibition” for the August weekend, and despite the rain paintings were sold! Also, in conjunction with the Courthouse Centre, TAG organised an art competition in the four National Schools in the area. 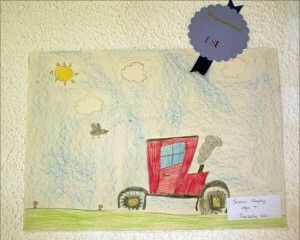 Children submitted 265 paintings showing their view of the Tinahely Show. The paintings provided one of the most colourful exhibitions that have graced the walls of the Courthouse. TAG provided seven prizes and the Tinahely Show Committee gave an award for the painting that most closely represented their vision of the Show. Introducing the presentation of prizes, Tony Clear thanked the children and their teachers and emphasised that choosing winners had been difficult, because all of the entries deserved to be winners. 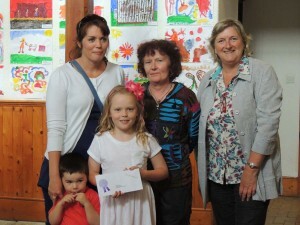 The prize winning was very well attended by parents and children. Maggie Dagge, the Courthouse Manager, presented the seven TAG awards, giving a perceptive analysis of each picture. 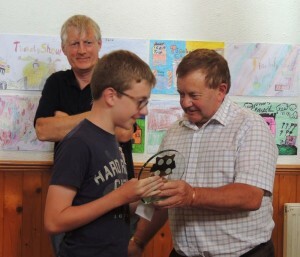 Tom Blake, President of the Tinahely Show Presented a beautiful plaque to the winner of the Showtime Award.